You are here: Home / Direct Sales / What Do You Do When Your Direct Sales Company Closes its Doors? Not too long ago, the popular direct sales company, Lia Sophia shut its doors after 28 years of being in business. It’s estimated that Lia Sophia employed more than 27,000 independent direct sales consultants who collectively sold more than $100 million worth of jewelry this past year. 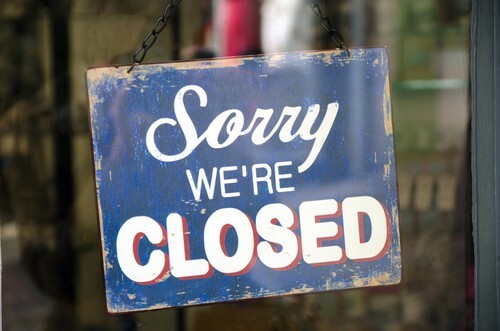 This isn’t the first time that a direct sales company has abruptly closed its doors; but sadly, Lia Sophia’s consultants are now left with picking up the pieces during the busiest time of year. If this scenario should happen to you or if you’re one of the 27,000+ Lia Sophia consultants, here are some steps to take to alleviate some of the stress and financial burden you’ve been thrown into. You've just lost your business and your income — it’s okay to give yourself some time to absorb the shock and reality of the situation. While it’s good to take a break, acknowledge your feelings, and prioritize self-care during this time, don’t let the circumstances define you. When you fixate on the negative, you perpetuate a cycle of destructive emotions that will only dig you deeper into a hole. If you feel like your sadness is becoming overwhelming, try surrounding yourself with positive people or talk to a healthcare professional to get you back on track. Also remember the basics, getting 8 hours of sleep, eating right, and exercising — these go along way in reducing stress. Maybe you have customers with pending orders, or perhaps you have upcoming parties scheduled — now is the time to quickly and efficiently tie up those loose ends. Verify with your company what the policies and procedures will be for pending orders, returns, unused gift certificates, and the like. Make sure that you’re clearly communicating with your current customers about what’s going on. While you may be uncertain about what path to take next, you will want to make sure that you’re not burning any bridges along the way — because there is a good chance these customers will remain customers in your next direct sales business. While you may not be ready to start looking at other home party business opportunities, it’s worth noting that you already have a current base of customers who love jewelry. For this reason, it’s highly recommended to check out your current competitors. Another reason to check out your current competitors, is some direct selling companies offer out-of-work consultants startup kits for free or discounted rates. Jade & Jasper – It appears they have gone out of business. Their website is down and their Facebook Page hasn't been updated since August 5, 2016. One of the biggest stressors will be your loss of income. Unless you have a traditional day job, you’ll likely be without income, at least temporarily. To help alleviate some of this financial stress, you may consider selling your samples and inventory. During this time you’ll also want to modify your budget to cut out non-essential spending while you’re figuring out what to do next. You may even consider doing some side tasks to bring in a little extra money. Were you affected by Lia Sophia closing their doors? What other direct sales companies sell jewelry? Hi! I just wanted to mention some minor corrections about eSBe Designs. Commission is 25 – 35% and startup fees are $299 – $2499. Thanks!! I know I was surprised to hear of their closing; Silpada has been in business for 19 years! Terribly sad for the consultants. Thanks for sharing this opportunity, Laura. You left off two highly reputable companies; Cabi and Ruby Ribbon. Please speak to a Stella & Dot Stylist in your area. S&D feels for all small business owners and are ready to help. We have been asked to not publicize any information, but you can easily contact a stylist for information let you know how we can ease your transition if you wish. Best of luck to everyone! I LOVE Stella & Dot — their jewelry is so cute! Chelsea Row is now closed too. I just found a new free affiliate program. Its call All About You Gifts – Adorable Apparel & Beautiful Accessories at AFFORDABLE Prices! Visit my Facebook page for more info or contact me. Really? Their website is still up … I’ll have to do some more research. Park Lane Jewelry was not mentioned. We have been in business for 60 years. I just joined them in January after being with Lia Sophia for 10 years. I have been thrilled with them. If you have been a manager with Lia or another company we will bring you in as a manager. Special incentives for former Lia Sophia advisers. Great quality jewelry, hostess rewards and customers specials. Commission between 30-50%. A few options for starter kits. Contact me at sparklebyparklane@gmail.com for more information. Thanks for the suggestion, Kim! Is the jewelry similar to Lia Sophia’s? If anyone is interested in learning more about Just Jewelry, I would be excited to share the opportunity. Just Jewelry consultants earn 50% commission, our start up costs is $99 and if you sign up by 12-31-14 at http://www.justjewelry.com/courtneyperkins you will receive an additional $100 in FREE Jewelry! Anyone interested can email me at cperkins@justjewelry.com for additional information.